Whew…. todays post is a big one and I don’t want you to miss anything! Here’s the run down…. 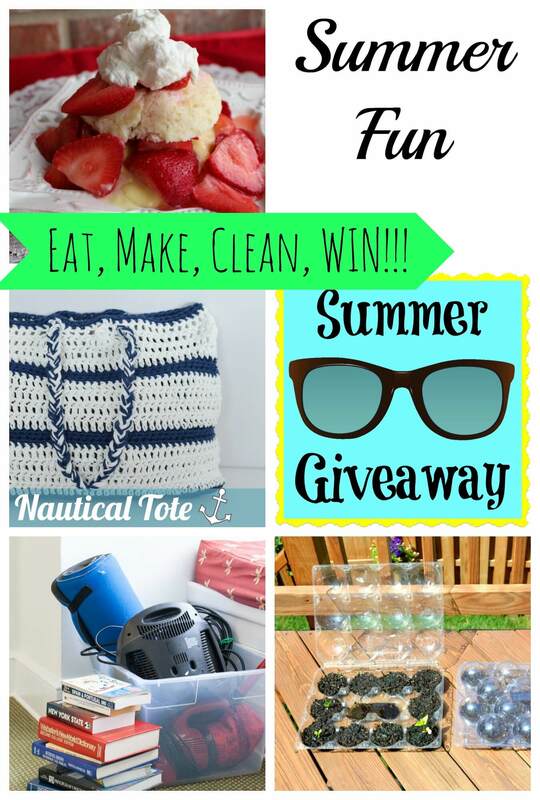 Check out the other great summer fun ideas from some of my favorite bloggers! 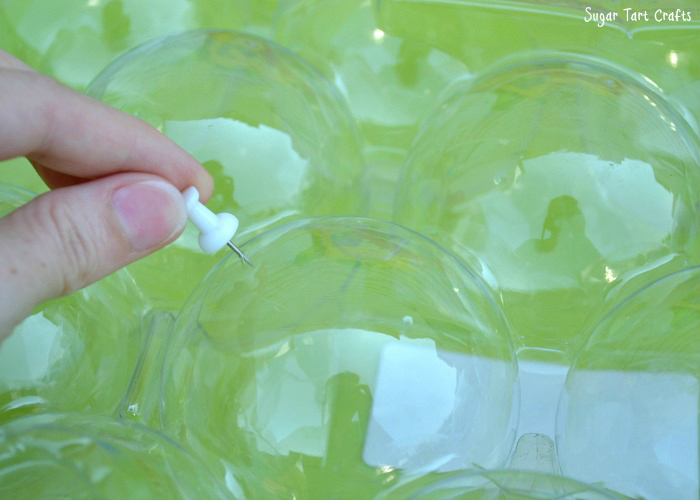 Learn how to make a mini greenhouse from Sugar Tart Crafts… AND enter the two great giveaways in this post! One for $650 in cash and the other for a $70 Target card… wahooo!! Enjoy!! 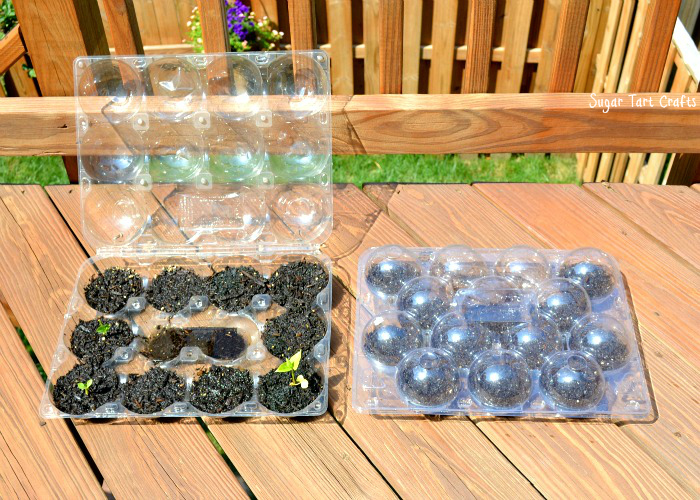 A big thanks to Toni for the awesome mini greenhouse tutorial, we will have to try this soon, my boys would love it!!! Hi all! Toni from Sugar Tart Crafts here for a fun little visit today. How is everyone’s summer going so far? We’re sweating our way through the first summer in a new house, so around here everything seems to be less about the pools and popsicles, and more about yard-work. Boo! Well boo on the work part at least because it’s been really fun seeing the yard’s transformation and the garden if full bloom. We’ve never had a yard before, and seeing all the gorgeous plants in all their glory is actually what inspired this project. 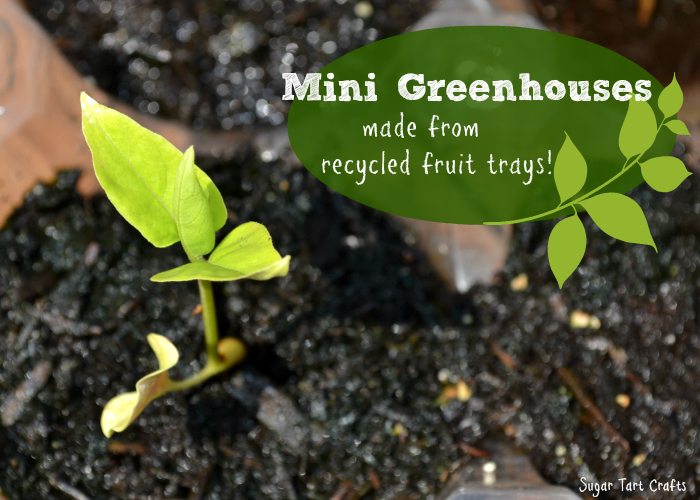 These little greenhouses are a great way to get your seedlings started for fall planting without loosing them to the August heat, or for apartment dwellers to share in a little bit of the gardening fun. You could probably even get an edible crop of leaf lettuce or spinach simply by transplanting your seedlings into a small flower pot. Yea for fresh greens! A plastic “blister package” with multiple cubbies. Costco sells apples, pears, etc. in these containers. 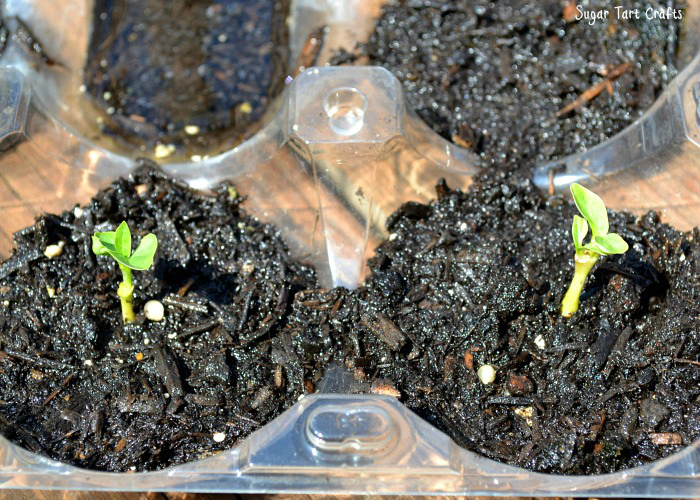 Seeds – Water – A thumbtack – And a sunny spot where your plants can grow without being disturbed. First use your thumbtack (or other sharp pointy object) to poke drainage holes in the bottom of each cubbie. If you live in a very dry area and would like to help increase the humidity in your greenhouse, leave a few of the bubbles intact. You’ll see why in a few steps. 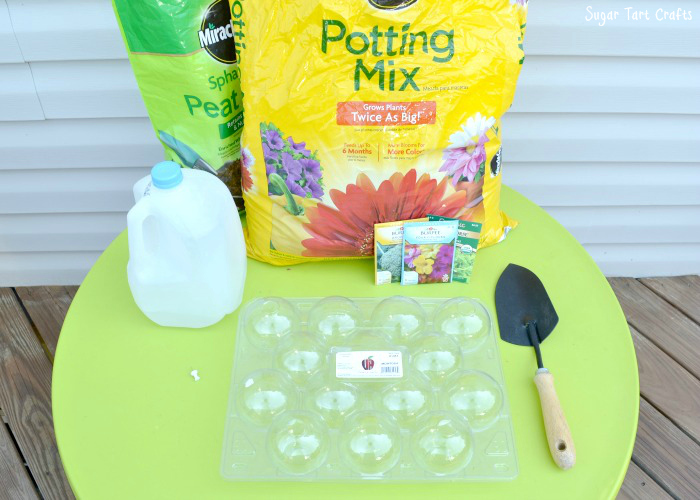 Add soil to the tray and follow the directions on your seed packets to determine what depth they should be planted. Water the seeds until the soil becomes nice and moist. 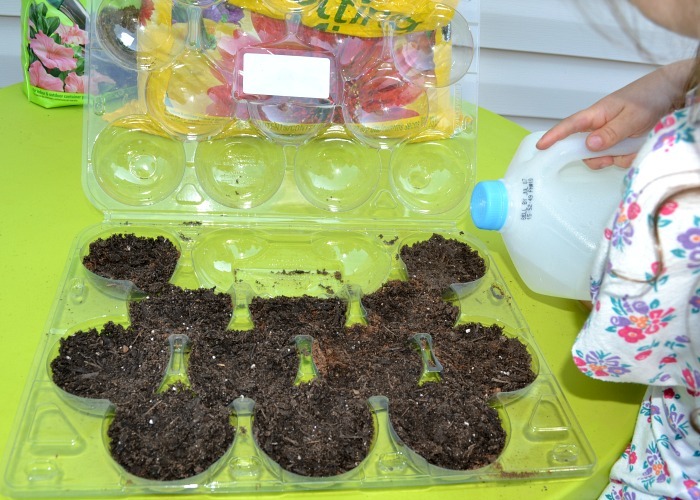 For this step we took our recycling to the next level by poking holes in the lid of an old milk jug to make the perfect kid sized watering can. 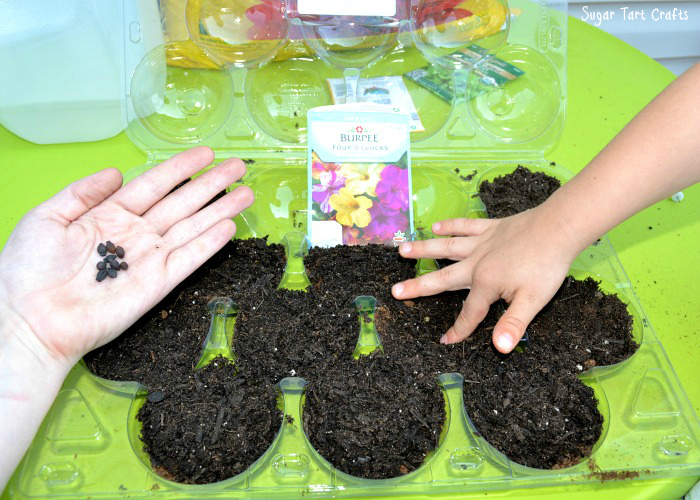 My daughter loves to help give her little seeds the “Sun, water and love” they need to grow! Don’t worry about your little helpers over-watering them though. Seedling need lots of water in the beginning to help them sprout, and any extra will simply leak out the drainage holes. Once they sprout, then you’ll need to let the soil dry out a little more. Speaking of holes – you may want to lay a towel under your greenhouse if you plan to keep it inside. 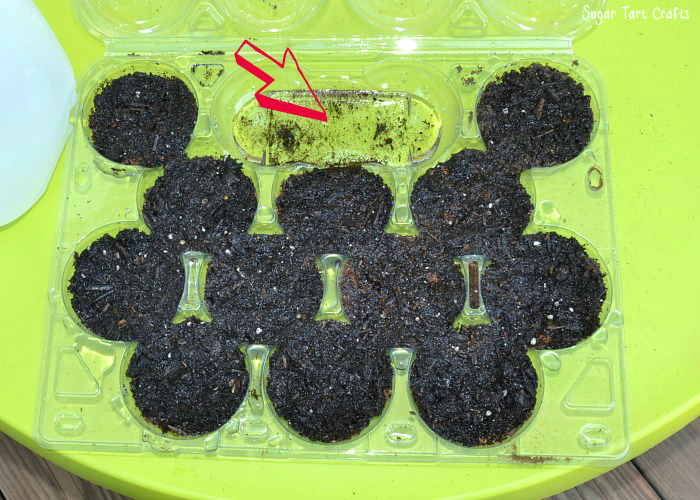 If you’d like to increase the humidity and help your seeds germinate faster, just leave a few bubbles unplanted (those ones you didn’t poke holes in) and fill them with extra water. This will also help your baby plants from scorching if you accidently forget to water them for a day or two. Now all you have to do is snap the lid shut and set your greenhouse in a sunny area where your family can watch your new plants grow! 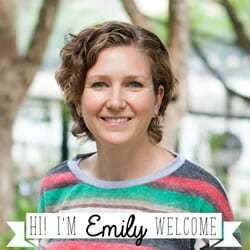 Thanks so much to Emily for having me, and I’d love to see some of you stop over to STC for a visit! When I’m trying to avoid the chores around the house, I share mostly kid’s sewing and tutorials. Right now I’m actually in the middle of my Indie Love Summer Collection, but with all the new house projects you never know what I’m gonna make next! Stay Cool, and Have a Great Summer! 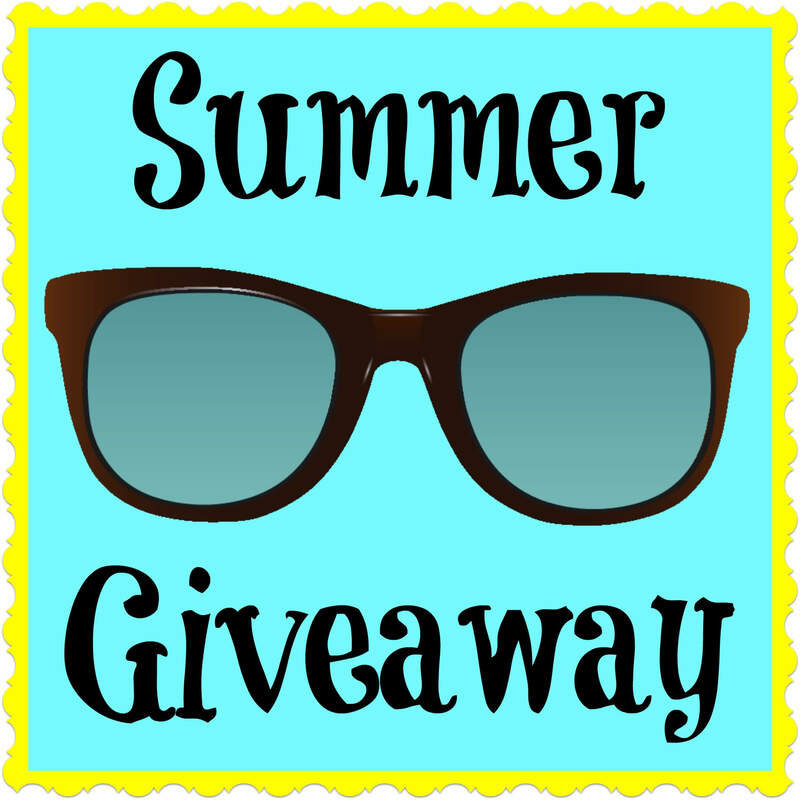 Now, before you go, enter these two great giveaways!! Giveaway is for one $60 Target e-gift card. 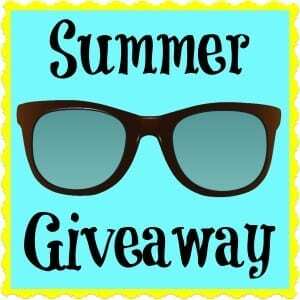 Giveaway is open from 7/17/14-7/24/14. Twitter is in no way affiliated with this giveaway. Only valid entries accepted. Winner will be contacted via email and will have 48 hours to reply and claim their prize. 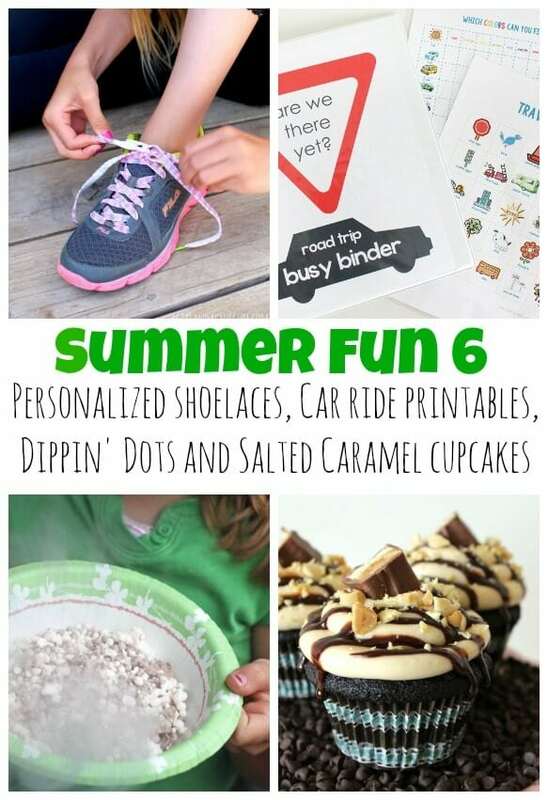 My kids would really love this project! I know!! We need to make these!